This summer, my wife had a business trip to London and I figured it would be great to tag along, checkout London, and then have a mini-vacation in Iceland on the way back. We only had four days in Iceland and wanted to see as much as possible so we rented a campervan from Happy Campers, located in Reykjavík. The staff at Happy Campers were both kind and very helpful and I highly recommend them if you are planning a campervan trip in Iceland. Just as a side note, if you end up booking through them, we ended up getting the "Happy 3" which had a raised roof, allowing you to stand up inside of the campervan, making it much more comfortable and spacious. One of the great things about Iceland during the summer is the duration of light, it never goes away! With the limited time we had on the island, the long days allowed for prolonging the the amount of exploring. As a photographer, another benefit is the angle of light in Iceland. Since the country is located in the northern latitudes, it seemed that even in the middle of the day, that nasty direct overhead light was non-existent. And I have to mention the weather, it seemed to change by the minute which was great for our little road trip. Since we didn't have enough time to drive the entire ring road, I was worried that retracing our steps back would be boring because we would see everything twice. Thankfully I was wrong, given the weather's dramatic mood swings in Iceland, even a trip along the same road can look drastically different from one hour to the next. The pictures in this blog post were intentionally ordered to chronologically follow our roadtrip. Starting in Reykjavík, we drove to the Golden Circle and then south to the ring road, hugging the south coast all the way to Djúpivogur where we turned around and started making our way back. Just as a point of reference, Djúpivogur to Reykjavík is around 550 km or 340 miles. The reason I'm listing the distance is that even though that may not seem to be that far, a little less than NYC to Pittsburgh, the changes in scenery over that distance are incredible. The variation and beauty of the landscape reminded me of the South Island in New Zealand. The waterfall shown above is called Seljalandsfoss. Click on the image to see the two different versions of the waterfall. The first image was taken using a neutral density filter which essentially limits the amount of the light, allowing for longer exposures which give the blurred water effect, where the second image is a more traditional photograph of the waterfall with the falling water frozen in time. Since Iceland is volcanic, geothermal power provide a sustainable clean source of energy for heating and production of electricity. A side benefit is the seemingly endless number of hot springs/pools around the country. The pool built into the side of a mountain shown above is called Seljavallalaug and is the oldest swimming pool in Iceland, built in 1923. Just to illustrate the diversity of scenery in Iceland, the pictures shown above and below were taken from the same roadside picnic area on the ring road. Although not visible in the picture above, there were thousands of birds flying around and presumably breeding up high on the mountain face. Although Iceland is known for its glaciers and waterfalls, birders make up another group of tourists that flock to Iceland. These photographs show where are journey reached its turnaround point in the small fishing town of Djúpivogur. Speaking of seafood, the best lobster (or called Langoustine in Iceland) I've ever had was from a place called Pakkhus in the town of Hofn. Although we ended up using the campervan's grill to make most of our food for the trip, the few meals we had at restaurants were all delicious and fresh, albeit pricey with the dollar to krona conversion. Jökulsárlón was probably my favorite part of the road trip. The area comprises of a glacial lake/river that flows directly into the sea. The shapes and colors displayed in the glacial ice is breathtaking. And as beautiful as it is, there is a sadness and guilt that overwhelms you as you watch these masses of ice float out into the sea, knowing that humankind's influence on the Earth is only accelerating the process. Traveling to Iceland in June was technically in their "high" season. But once you travel outside the more popular Golden Circle, open roads like the one shown above are the norm. Definitely on the opposite end of the spectrum compared to here in NYC. If the picture above looks familiar, it is because it is the same waterfall shown on the background of the new iMac Retina, although I think someone went a little overboard with their editing. 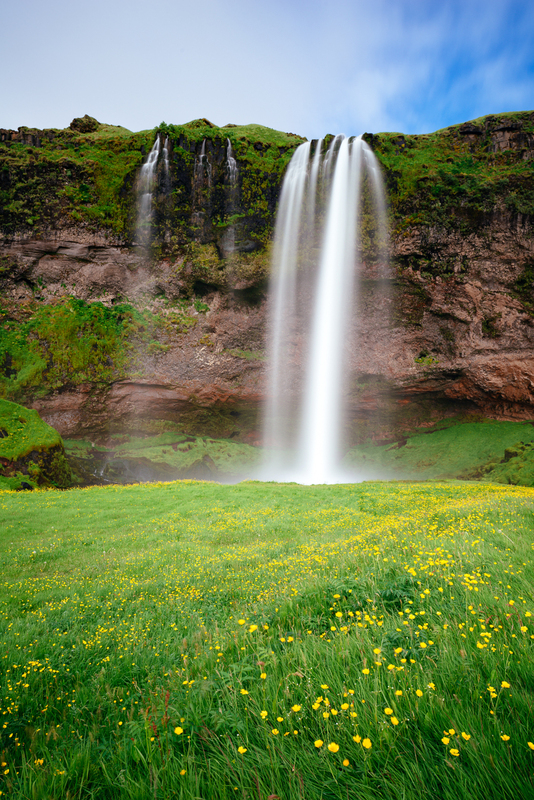 Skógafoss is one of the more popular waterfalls in Iceland as it is easily accessible from the ring road. And this post ends with a photograph of the horses that are ubiquitous to Iceland. My only regret from the trip is that this is the only horse photograph I captured.